ever find yourself with a shitload of windows open in the finder and all you really want to do is get back to the one (or more) folders that you use the most? of course you have. here’s a groovy little app that will restore your finder to a predefined setup you choose yourself. after downloading, drag the app to your preferred launch location. you may find the toolbar is most appropriate for this one. next, set your finder windows exactly as you want them to appear by default. the example below shows a larger window, in column view, pointing to the user folder and a smaller window, in list view, pointing to the documents folder. you can set as many windows as you like. now you’re ready to click the app. the first time you run it you’ll get this message — reminding you to set things up the way you want them before continuing. 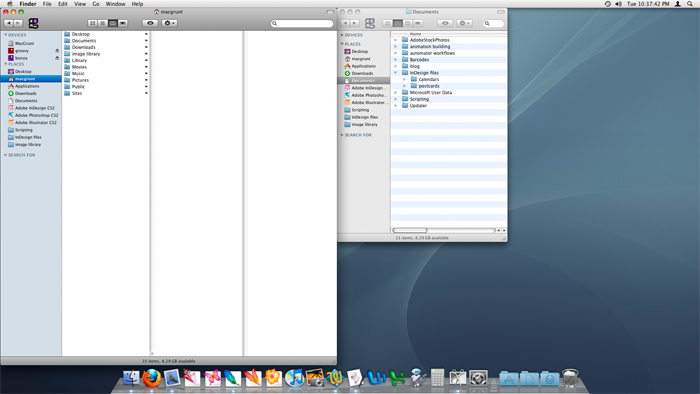 every time you run FinderCleanup after that, it will simply reset your finder to your chosen setup. mgProps begins life as an empty variable, but gets populated with all the data necessary to replicate your chosen finder setup the first time the app is run. this data persists after the app is run. that is, the data is saved as an integral part of the app. if you change your mind and want different windows opened by default, simply open FinderCleanup in the Script Editor application, click the compile button, save and close. this resets mgProps to an empty property and the app will behave as though you’re running it for the first time. 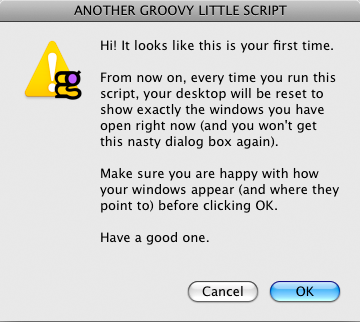 You may also be interested in this nice little applescript from Nik’s Crappy Blog to pack away all your desktop clutter hide-and-restore-desktop-icons. This entry was posted in applescript, OS X and tagged applescript, finder, how to, Mac, OS X, OSX, reset windows, tutorial by macgrunt. Bookmark the permalink.